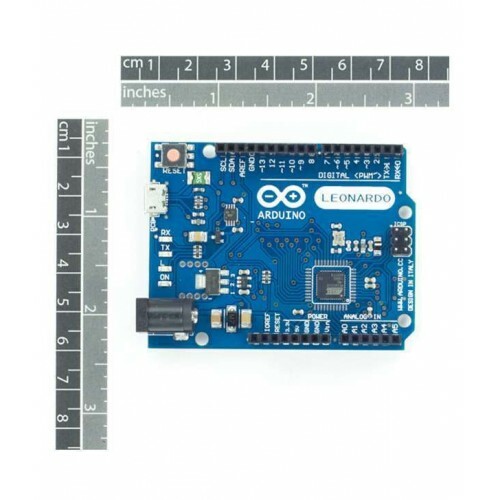 Purchase online Arduino Leonardo Board in India at low cost from DNA Technology, Nashik. Arduino Leonardo differs from all preceding Arduino boards in that the user-programmable ATmega32U4 AVR micro-controller has built-in USB functionality, eliminating the need for a secondary processor. Arduino Leonardo is an open source precise microcontroller board based on the ATmega32U4 SMD IC. It has 23 digital input/output pins (of which 7 can be used as PWM outputs and 12 can be used as analog inputs), a 16 MHz crystal, a USB connection, a power jack, an in-circuit system programming (ICSP) header, and a reset button. It contains everything needed to support the micro-controller; simply connect it to a computer (or appropriate wall power adapter) with a Micro USB cable or power it with a AC-to-DC adapter or battery to get started. This makes the Leonardo more versatile: in addition to supporting a virtual (CDC) serial/COM port interface, it can appear to a connected computer as a mouse and keyboard. Projects that require High Speed Processing.